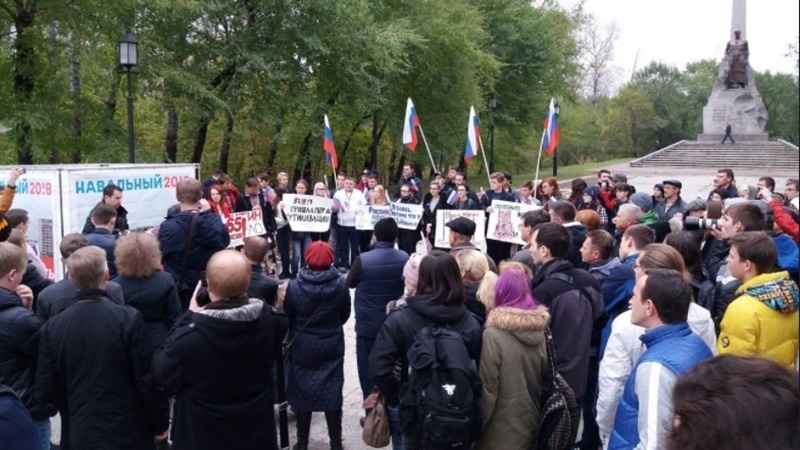 October 7, supporters of the Russian oppositionist Aleksei Navalny began rallies in Russia. Mass actions began in the cities of Khabarovsk, Ulan-Ude, Chita, as well as Vladivostok, Kemerovo and Komsomolsk-on-Amur. — Штаб АН в Хабаровске (@teamnavalnykhv) 7 жовтня 2017 р. No detentions or clashes with the police during the rallies were reported. Earlier, QHA informed that Russian oppositionist Aleksei Navalny had announced that protests would be held throughout Russia on October 7. Pickets are expected to be held in 80 cities of Russia, where Navalny's headquarters were opened. The opposition calls on everyone to join them. He had submitted an application for a rally on Pushkin Square in Moscow, but the city authorities rejected it without offering another venue. Earlier, Aleksey Navalny was arrested for 20 days for "repeated appeals to participate in uncoordinated actions." This decision was taken by the Simonovsky District Court of Moscow. The court concluded that the administration of Nizhny Novgorod had not agreed a meeting of supporters of Navalny, which was scheduled for September 29.